You've no doubt heard about assisted living and nursing home care, but there are many other long-term care options available. An article by U.S. News & World Report provides an introduction to the types of care now available. Adult day care offers relief to family caregivers and a safe, social environment for older adults. It is suitable for people with mild cognitive impairment, Alzheimer's disease, or other forms of dementia; people who could benefit from speech, music, occupational, or physical therapy; and elders who crave activities and interaction with peers. Adult day care centers for people with dementia occasionally offer nighttime hours in recognition of the fact that some seniors are more active at night. The concept behind aging in place is to live independently in your own home and community as you grow older. Home modifications such as widening doorways to accommodate wheelchairs and installing grab bars in bathrooms make aging in place possible. Even people with chronic medical conditions can remain at home longer with the help of home health care aides. 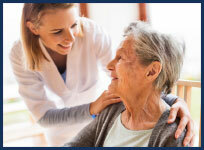 As the name implies, home health aides provide services in an elder's own home. For example, certified nursing assistants or patient care assistants under a registered nurse's direction can provide health-related services such as checking vital signs, changing bandages, and assisting with medications or medical equipment. In addition, home health aides or elder companions can assist with personal chores such as meal preparation, light housekeeping, grocery shopping, transportation, and bathing. You can find in-home health aides through a home-care agency. Continuing care retirement communities offer a "tiered" or "one-stop" approach to meeting the needs of aging adults by providing a wide range of care options at a single location. The spectrum of care starts with independent living in single-family condominiums or apartments for relatively healthy adults. As a senior's daily needs change, he or she can transition to on-site assisted living or nursing home facilities. This convenience comes at a price, however. CCRCs are expensive and often include substantial upfront entrance fees and monthly charges. Upon enrolling in a CCRC, residents typically select from extended (all-inclusive), modified, or fee-for-service contracts. Co-housing is a community-focused arrangement that combines private homes with shared gathering spaces. Co-housing communities for those over 55 years of age may be particularly attractive for seniors who want to live among peers who share common interests and hobbies. As of this writing, co-housing options are rather limited. You can learn more about this option by visiting the Cohousing Association of the United States website at www.cohousing.org. A medical foster home is a private home operated by a trained caregiver. Residents may be elderly adults with chronic physical or cognitive health needs who require assistance in daily living, or younger adults with disabilities who want to reside in a noninstitutional setting. The United States Department of Veterans Affairs oversees a program that encompasses about 700 U.S. medical foster homes and serves approximately 1,000 military veterans. Medical foster homes are not restricted to veterans, however. Many people in the United States live in non-VA adult foster home arrangements. Post-acute care is palliative or rehabilitative care for people who have recently been discharged from a hospital. Rehabilitation centers, nursing homes and other facilities may offer post-acute care. In some situations, post-acute therapy can also be provided on an outpatient basis or at home. Assisted living facilities offer services, such as medication management and light personal care, not available at most retirement or independent-living residences. Assisted living focuses on remaining independent within a supervised setting. Residents can choose from options including prepared meals, housekeeping, medication management, and help with activities of daily living such as getting dressed and showering. Assisted-living facilities frequently offer a wide range of activities, including exercise sessions, gardening, crafts, and movie nights to keep residents engaged and foster socialization. Group dining is the norm. Assisted-living communities take many forms, including suburban complexes that cater to dozens of residents, single-house settings, city apartment buildings, and more. Also known as skilled nursing facilities, nursing homes provide personal and medical care services beyond what is typically available in assisted living facilities. These services usually include nursing care, 24-hour supervision, assistance with the activities of daily living, and three daily meals. Occupational, physical and speech therapy services may also be offered. In some situations, such as rehabilitation after a hospital stay, residence in a nursing home is temporary. However, the majority of residents live in nursing homes permanently because of chronic physical or mental health conditions, or a combination of the two, that can be effectively managed only with continual care. Examples of continual care provided by nursing homes include managing oxygen treatments, applying eye drops, and other forms of health/custodial care. According to the American Humane Society, approximately 46 percent of households have at least one dog and 39 percent of households have at least one cat. We love our pets, and they provide us with plenty of love in return. Tragically, however, shelters and veterinarians euthanize approximately 500,000 pets each year when their owners predecease them. How can you be sure your beloved animal companion will receive proper care when you are no longer able to provide it yourself? A trust may be the answer. The main objective of using a trust to care for your pet is to provide a flexible method for managing financial assets for the benefit of any pets that survive you. The appropriate amount of money to fund the trust varies according to your pet's age, condition and needs. With a properly designed trust, you can also designate a party to act as "caretaker" for your pet. Needless to say, this is a very important decision. Don't assume the person you choose will accept the responsibility--always ask. You can name alternates if your first choice is unable to serve in this capacity when the time comes. In addition, your trust should provide detailed instructions to your caretaker. This can include everything from your pet's favorite food and toys to his or her sleeping arrangements. To learn more about pet trusts, we invite you to contact us for a personal meeting. 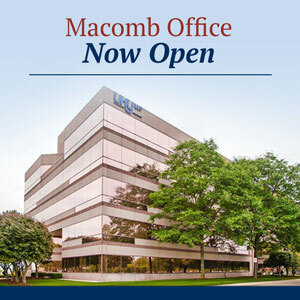 We are happy to announce the opening of our third office to serve clients in Macomb, Michigan!